Young Frank Chavasse, who lived in Wylde Green House, wrote in his diary on April the ninth 1864 “Very shocked to read in the paper of the sudden death of Mr. Attwood”. Thomas Aurelius Attwood, who lived in Kingsbury Road Erdington in the venerable old manor house of Pype Hayes, was a friend of Frank’s father, Thomas Chavasse. Attwood was a banker. 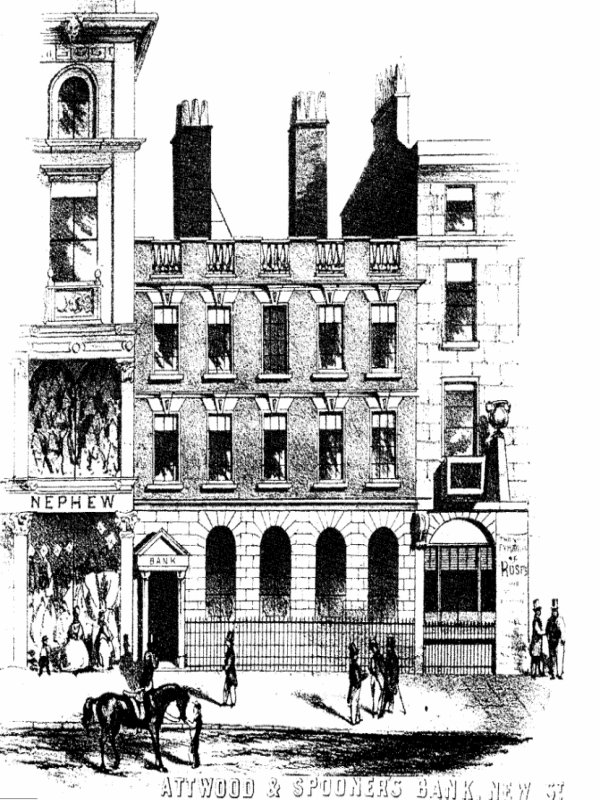 Attwood and Spooner’s bank was in New Street, Birmingham, next door to the Hen and Chickens Hotel where, at a meeting in 1845, the Birmingham and Lichfield Railway Company was formed. This company did not succeed, but both Thomas Chavasse and Attwood were on the committee set up in 1857 to form the provisional Board of the successful branch railway line to Sutton. Subsequent entries in Frank Chavasse’s diary (copies of this and Sarah Holbeche’s diary, both transcribed by Janet Jordan, are in Sutton Reference Library) record his father’s financial worries - Thomas had money in Attwood’s bank as well as speculating heavily in the doomed Royal Hotel Scheme. Not all was lost, however, as the creditors received a payment of 11 shillings and 3d in the pound. As one bank failed another was flourishing. Lloyds Bank, which had been a family concern, was formed into a Company in 1865, Samuel and Thomas Lloyd being among the shareholders. The Lloyd brothers were ironfounders with a large ironworks in Wednesbury - when they came to live in Sutton Sarah Holbeche did not approve “August 12th 1866 Lloyds brothers made their appearance as occupants of Moor Hall and the pew (particular pews in the parish church belonged to certain houses) - specimen of Black Country gentry - oh! for the shades of the Hacketts (the aristocratic former occupiers of Moor Hall)". Miss Holbeche was more tolerant of the Lloyds in their role as bankers - she approved when Miss Lloyd opened a branch of the family bank at 24 High Street in August 1864, and four years later banking was a respectable profession - her nephew Aemelian Holbeche was taken on as a banker’s clerk by Lloyds and Co. at a salary of £40 per annum. 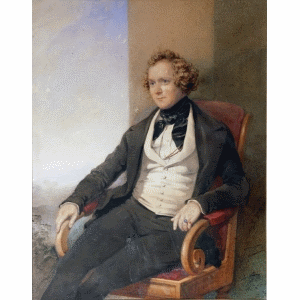 Portrait of Thomas Aurelius Attwood 1810 -1864 in Dudley Museum and Art Gallery (courtesy of Dudley Museums Service).